Climate negotiators have finished their work last month in Warsaw with minor agreements but no breakthroughs on an agreement that would avert catastrophic climate change. One of the areas of greatest consensus in Warsaw was the agreement reached on the United Nations Reduced Emissions from Deforestation and Forest Degradation (REDD+) program, aiming to quantify the environmental value of forests, giving forest nations cash credit for preserving the ecosystems that help keep carbon out of the atmosphere. Deforestation causes 10 percent of global greenhouse gas emissions. While forests are obviously vital for a healthy planet, REDD+ may be no more than a hollow solution to deforestation. It also presents a threat to the indigenous forest communities that make up part of IPCCA. In 2011, IPCCA members issued a declaration in opposition to REDD+ and the livelihood threats that its implementation would cause in indigenous communities. REDD+ doesn’t adequately respect the indigenous communities who live and manage the forestland REDD+ is designed to protect. “REDD+ locks up forests, blocking access and customary use of Indigenous Peoples and local communities to their forests,” IPCCA members stated. Moreover, by providing cash credit for preserved forests, it’s likely that REDD+ will sharply increase their market value, amplifying the vulnerability of indigenous communities to land speculators. During the negotiation process, there has been some acknowledgement of these concerns. The result is a proposal for “safeguards,” regulations to prevent the harms associated with REDD+ while maintaining its emissions-reduction potential. These rules include protections for indigenous peoples and local communities, safeguards for biodiversity and improvements in governance. Neither were there any real advances in Warsaw on the non-carbon benefits of forests. Civil society has grown more aware of their importance, but negotiations are still focused on monetizing non-carbon benefits for their incorporation into REDD+. “REDD+ is a market-based approach through which outside actors try to commodify what is sacred to Indigenous peoples,” the declaration stated. Instead, the global climate regime could stand to learn a thing or two from the non-market approaches of indigenous peoples, who have been effective environmental stewards for centuries. 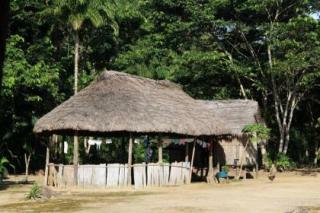 Protecting indigenous territory has been shown to be an effective forest conservation method in itself. IPCCA representatives will continue to educate both parties and observers on the benefits of traditional knowledge and local governance for reducing deforestation and forest degradation when IPCCA members return to negotiations next year in Lima.